smuggling vehicle spare parts and lubricants. Ismail Gani, 49, Ilir Naska, 32, Erland Topalli, 40, Arben Kolgjini, 48, Arbri Arapi, 28, all resident in Tirana are arrested in flagrance, while GG, 43, resident in Fier and AG , Resident in Tirana are declared wanted. The Police found in Prush road a bus, from where some carton boxes were removed filled up with lubricating oils and various spare parts for vehicles. These boxes were loaded in a van with the driver Ilir Naska. 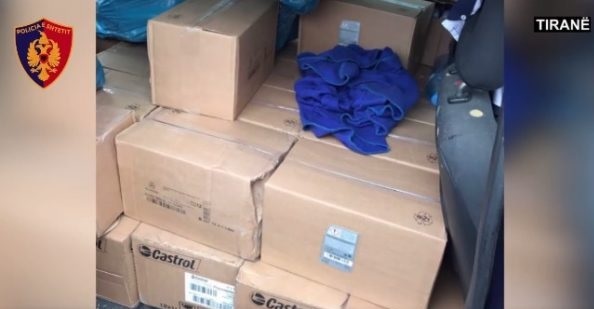 The police seized the bus transporting smuggled goods, the van where smuggled goods were loaded, 372 liters of vehicle lubricant oil with the "Kastrol" logo, 480 liters of vehicle lubricant oil of PKW Motor brand, 33 water pressure tubes and intercooler, 20 wheelchairs for automobiles, 6 different size filters, a Fiat type vehicle, and 6 different brands of mobile phones. Specialists of the Economic Crime Section are working to identify and put forward the responsibility of other persons implicated in this illegal activity.